Figures from Defra have revealed that UK pig numbers on December 1, 2018 totalled 4.6 million head. This was more than 1% lower compared with the same point a year before, but still above 2016 levels. 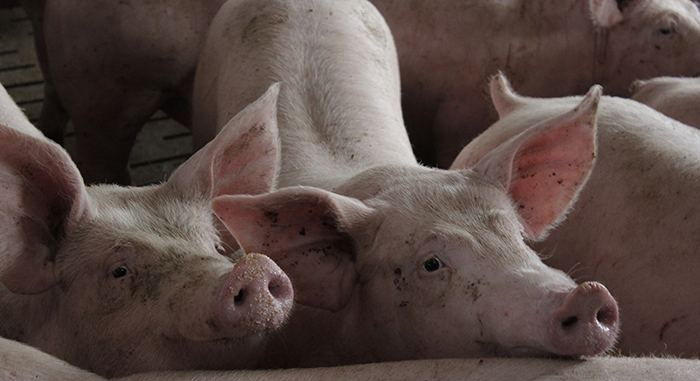 The decline was largely due to a 1.5% fall in the number of fattening pigs. Pigs under 50kg in particular declined by over 2%, while the heavier weight bands were more stable. This might suggest a tightening in pig supplies over the coming months. However, census results don’t always reflect subsequent slaughter levels, so should be viewed with caution. 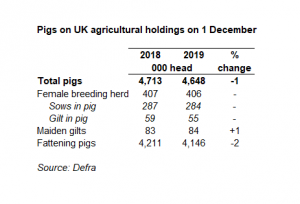 AHDB analyst Bethan Wilkins said the figures suggest female breeding herd remained broadly stable and the number of maiden gilts actually rose 1% to the highest number since 2015. She said: “A blip in productivity levels, following the hot summer last year, might mean throughput is limited in the coming months. However, as these challenges phase out and if the usual improving trend resumes, production growth could return in the latter part of 2019. Figures for Scotland have also been released and show a similar picture.